Multiplying by a power of ten is a neat, alternate way of writing a number that has many zeros. The table below is a reminder of the value of some powers of ten. Finding the value of the exponent is the main challenge when using scientific notation as this tells us the number that we multiply the co-efficient by. One method to help with this is to think of multiplying by powers of 10 as moving the decimal point - one place for each power of ten. If you think of each move as a hop then you can find what power of ten to multiply the coefficient by. 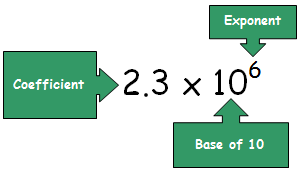 The example below shows that 2.3 multiplied by 106 - six hops - makes 2,300,000. All the examples above have been of large numbers. Scientific Notation is also very useful for representing very small numbers. In these cases, instead of multiplying, we are in effect dividing by powers of ten. We use negative exponents to show this. Try the worksheets below to practice scientific notation..